 A handcrafted wooden game board that represents the first 12 frets of a guitar.  78 music chips which match the 78 notes on the game board. 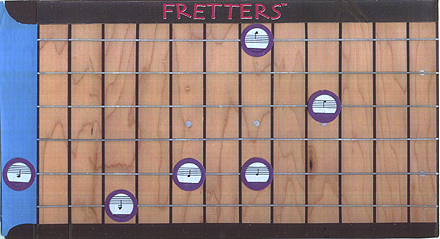  2 Fretters reference sheets to help you match the music chips to the spaces on the board as you play.  A chord chart and scale located underneath the box top.  picked: a space on the game board is PICKED when a letter-side-up music chip lands on a space of its matching notation. The music chip is then turned notation side up.  open strings: the term OPEN STRING refers to the sound the string makes when no fingers are placed on the guitar neck. The string is played "open". The OPEN STRING notes are represented by the blue section of the game board.  frets: a guitar neck has about 20 frets. The 20th fret is next to the large sound hole; the 1st fret is at the other end next to the tuning knobs (or "machine heads"). In front of the frets are where your fingers are placed when the fingers of your other hand strum or pluck the strings. In between the natural notes F and G is the F sharp note (F#). This note can also be referred to as G flat (Gb). There are several other sharp and flat notes on the game board. They are not included on the reference sheets but at a glance are easily located. Octave comes from the Greek word for eight. An octave is the distance between two notes with the same name, eight notes apart in a scale. The distance from one C to the next C  either direction  is an octave. The same rule applies to all the other notes. The side of the music chip showing the music notation is right side up when the cut-out flat portion of the label is at the bottom. Here the MUSIC CHIPS of both colors have been placed notation side up on the correct corresponding OCTAVES of the first two frets and OPEN STRING spaces. The fretted notes are ON THE SILVER LINES IN BETWEEN THE BROWN FRET LINES. In this game only the natural notes are used: As, Bs, Cs, Ds, Es, Fs, and Gs. The sharp and flat notes are not played. Throughout this game the MUSIC CHIPS are played letter-side-up. The object of the game is to move the MUSIC CHIPS from the 12th fret side of the board (right side) to the matching letter note spaces of the OPEN STRING section (blue section).  The players alternate moves. Player RED chooses a MUSIC CHIP and moves the number of spaces indicated by a roll of the black die. The move begins from off the board and onto the first corresponding letter note, jumping from one octave to the next, which will always be 2 or 3 frets away. Player PURPLE goes next and does the same. Player RED's next move can be to advance further the same MUSIC CHIP or introduce a new one into the game. Player RED has begun the game by rolling a two and moving the D MUSIC CHIP two octaves to the 1st string, 10th fret. Another option was moving it to the 6th string, 10th fret.  MUSIC CHIPS can move forward or backward across the board. If a player rolls a number higher than the number of spaces required to reach the end of the board, the MUSIC CHIP must reverse and come back the remaining number. MUSIC CHIPS occupying OPEN STRING notes may also move backward across the board.  Only one MUSIC CHIP at any time can occupy a space.  Players may MUTE (capture) an opponent's MUSIC CHIP of the same letter note by landing on it at the end of a move, including MUSIC CHIPS occupying the OPEN STRING spaces. The MUTED chips CANNOT be played again. Players can MUTE their own MUSIC CHIPS and those chips can be played again. MUTING is the only way MUSIC CHIPS can exit the board. The first player to place MUSIC CHIPS simultaneously on four of the six OPEN STRING notes wins the game. The game can also end when a player is no longer able to land a MUSIC CHIP on an OPEN STRING space. The player occupying the most OPEN STRING spaces wins. Good luck. In this game only the players' natural notes As, Bs, Ds, Es, and Gs are used. 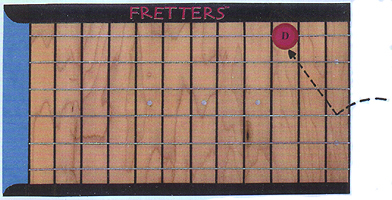 The game begins with six of player RED's matching letter-side-up MUSIC CHIPS set up on the 12th fret side of the board (right side). Player PURPLE's six MUSIC CHIPS are set up on the OPEN STRING notes section of the board (blue section). At this stage of the game the music notation  the OCTAVE  of each chip is unknown to the opponent. Player RED goes first by advancing a MUSIC CHIP one space forward. Player PURPLE then does the same from the other side. The object of the game is to land as many MUSIC CHIPS as possible on the correct spaces of the far side of the board. They must be of the correct corresponding OCTAVES. When this happens the notes have been PICKED, and are turned notation side up. They CANNOT be removed and the opponent can no longer introduce additional MUSIC CHIPS to those strings.  Once a MUSIC CHIP vacates the initial space on the board the player may use a future turn to introduce another same letter note MUSIC CHIP to the board on that space.  MUSIC CHIPS can move in any direction vertically and horizontally  not diagonally. Only one MUSIC CHIP at any time can occupy a space.  A player may MUTE (capture) an opponent's MUSIC CHIP by landing on it with a MUSIC CHIP of identical music notation (same octave). The remaining chip continues to play. These E chips are of the same music notation (same octave).  If the two chips do not have identical music notation, the landing chip is removed from the board and can be played again later. Only chips of the same letter note can attempt to mute one another. These E chips DO NOT have the same music notation (different octave).  Leap Frog Rule: Players may also attempt to MUTE an opponent's MUSIC CHIP two spaces away, or occupy an empty space two spaces away, by JUMPING over an adjacent MUSIC CHIP.  MUSIC CHIPS may exit the board from the same side they started. Players can MUTE their own MUSIC CHIPS for strategic reasons. Those chips can be played again.  When a music chip PICKS that final matching space on the far side of the board, any MUSIC CHIP occupying that space is MUTED from the board regardless of its OCTAVE or color. The game ends in one of two ways: (1) A player PICKS four of the six notes on the far end of the board; Or, (2) when a player is unable to PICK any more notes. The player with the most PICKED notes wins. Hopefully it's not a draw. Good luck. To play Domino Fretters, the MUSIC CHIPS are separated by color and placed in separate paper bags or bowls.  Player RED randomly slects a music chip and places it on a space of its matching notation (correct octave).  Player RED then selects another chip and, if possible, places it on a matching space adjacent to the first chip  above, below, or to either side (not diagonally).  Player RED continues this process until he or she is unable to place a music chip adjacent to a chip on the board. The unused music chip is kept by player RED for the time being.  The turn is then passed to player PURPLE. The process alternates between players.  Players will accumulate unused music chips that cannot yet be placed on the board. During a player's turn those chips may be placed on the board adjacent to other chips.  MUSIC CHIPS can be placed on the board adjacent to chips of either color, and chips of both colors may occupy a same space.  The first player to place music chips on every space of the board wins. All MUSIC CHIPS are separated by color and placed in separate bags or bowls.  The players take turns randomly selecting a MUSIC CHIP and placing it on a space of matching music notation.  Chips of both colors may NOT occupy a same space. If a player places a MUSIC CHIP on a space already occupied by an opponent, the opponent's chip is MUTED (removed) from the board and returned to the bowl of chips.  The first player to place MUSIC CHIPS on all of the notes to complete a chord wins. Player PURPLE has won by placing music chips on the spaces of the E minor chord. Before the game begins the players decide the number of frets to be played. 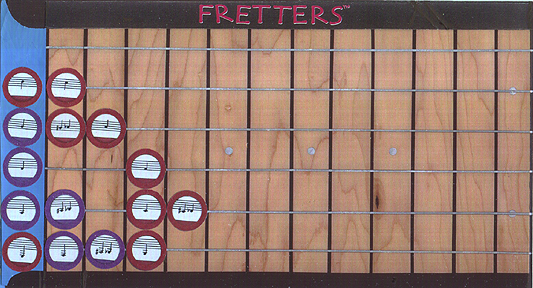 The example below is the setup for a 2-fret game. MUSIC CHIPS of the FIRST TWO FRETS and OPEN STRINGS SECTION are placed on the spaces of their matching notation (correct octaves). Players then collect the MUSIC CHIPS of their corresponding color. (The game begins with NO MUSIC CHIPS ON THE BOARD.) These will be the only music chips used in this particular game. Players alternate moves. RED goes first by rolling the BLACK DIE and moving a MUSIC CHIP, letter-side-up, the number of spaces indicated by the die. The MUSIC CHIP begins its move from off the board and onto any space of the 12th fret. The object of the game is to land a MUSIC CHIP on an OPEN NOTE SPACE (blue section) of the correct octave. Once this is done the note is PICKED (turned notation side up). The other two notes on that string are now available to be PICKED by that player (in no particular order). A player wins the game when all three notes of a string are PICKED.  Select any MUSIC CHIP from your collection to move during a turn. The MUSIC CHIP can move in any direction vertically and horizontally  not diagonally.  You many NOT cross over or land on a same space twice during a move. You may cross over or land on spaces from previous moves.  Players may move across MUSIC CHIPS that are letter-side-up, but must move around chips that are notation side up  PICKED NOTES.  Players can attempt to MUTE other MUSIC CHIPS by landing same letter note chips on one another. If it turns out the two chips are different octaves, the landing chip is MUTED from the board. MUTED MUSIC CHIPS are returned to the players and can be played again.  The game always begins from off the board and onto the 12th fret, regardless of how many frets of the board are played. All MUSIC CHIPS are separated by color and placed in separate bags or bowls. The two players take turns randomly selecting a MUSIC CHIP. The first player to select a note that can be placed on one of the OPEN STRING notes does so, and becomes the "offensive player" in the game. The goal of the offensive player is to place MUSIC CHIPS adjacent to his or her own color chips and eventually link them across the board and reach one of the notes on the 12th fret. The opponent  the defensive player  must try to block all passegeways and prevent the offensive player from reaching the 12th fret side of the board.  MUSIC CHIPS are placed on the board notation-side-up and must be of the correct octave.  The OFFENSIVE PLAYER can only place MUSIC CHIPS adjacent to his or her own chips, vertically or horizontally  not diagonally. The DEFENSIVE PLAYER can place chips on the board adjacent to either color.  Only one MUSIC CHIP can occupy a space.  The players will accumulate MUSIC CHIPS that cannot yet be placed on the board. Many of them can be placed on the board (only one per turn) at anytime during the game instead of selecting a MUSIC CHIP from the bowl of chips. This game is played by only one player. The player chooses a color and spreads all 78 MUSIC CHIPS, letter-side-up, next to the game board. The player randomly selects two Es, one B, one G, one D, and one A, and places them on the game board on their correct matching octaves. The board might look something like the example below. The remaining 72 MUSIC CHIPS are randomly collected, letter-side-up, in six stacks of 12. The top six MUSIC CHIPS are selected and, if possible, placed on the board adjacent to the six chips on the board  above, below, or to either side (not diagonally). The MUSIC CHIPS that cannot be placed on the board are kept by the player for the time being. The player then selects from the six stacks the same number of chips that had just been placed on the board. The process repeats.  At no time can the player possess more than six MUSIC CHIPS.  The MUSIC CHIPS are selected from the six stacks of chips in sequential order.  At anytime during the game the player may place the collected unused MUSIC CHIPS on the board adjacent to the other chips.  The game is won when all 78 MUSIC CHIPS are placed on the game board. The game is lost when the player still has MUSIC CHIPS in his or her possession and is unable to place any more on the board adjacent to the other chips.  One suggestion: Use the wooden music chips tray, propped up at a 45 degree angle, to hold your 6 stacks of chips as you play. This game is the same as explained on page 4 except each turn the players move the number of spaces indicated by a roll of the BLACK DIE.  MUSIC CHIPS can move in any direction vertically and horizontally  not diagonally.  You may NOT cross over or land on a same space during a move. You may cross over or land on spaces from previous moves.  Players may move MUSIC CHIPS across other letter-side-up chips. For illustrative reasons it has been implied that Player RED goes first to start a game, but the official way to determine the first move is as follows: The players randomly select a MUSIC CHIP of their color. The player with the note highest up the chromatic scale goes first. Player PURPLE's high D note ranks higher than RED's low C.
2. When you play Tic-tac-chords for the first time you might find that the number of chords (located underneath the box top) are a little bit overwhelming. Try playing just one section, such as the Major chords. Once you and your opponent get to know the 12 Major chords well, add another group into the game. With a little time and patience you will eventually learn them all. 3. 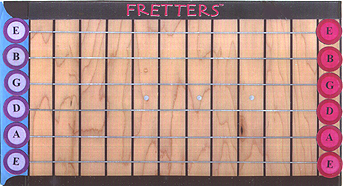 When playing Fretters Goes To War and Fretters On A String it is important that the music chips, when letter-side-up, are indistinguishable from one anohter (i.e.  all red G chips look alike). Treat them with care; use clean hands, keep out of direct sunlight, etc. However, if any of them should get scuffed, damaged, or lost, dont worry  they can be replaced by simply going to the Fretters website and ordering more. 4. For more information about Fretters, and a lot of other neat stuff about music and musicians, visit the Fretters website at www.Fretters.com.